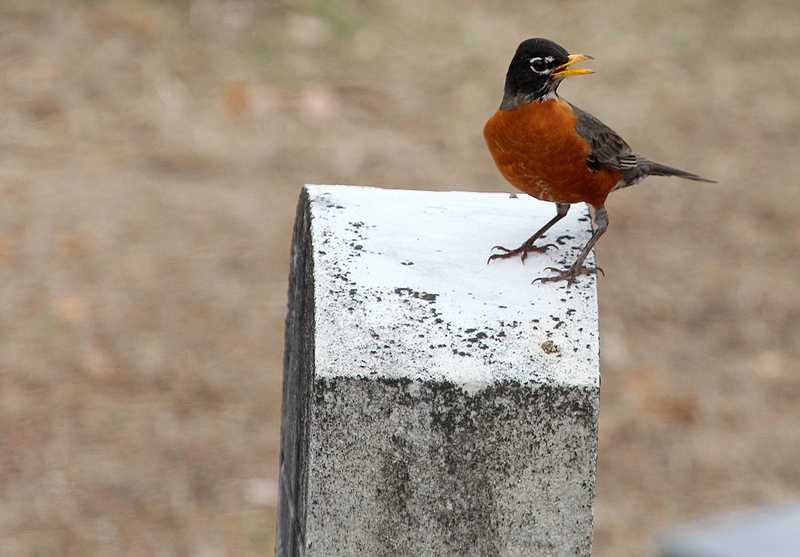 An American Robin perches on a gravestone at at a cemetery in Darien, Conn., April 2014. A raccoon knocked over something in the backyard around three in the morning. The crash woke me from a dead sleep, so I got up to investigate. A quick look in the pitch-dark with a cheap flashlight did not yield the cause of the crash. The potted plants looked to be intact and the birdfeeders seemed to be in their place. I went back to the screened-in porch to continue my night’s sleep, but sweet dreams eluded me. I used to be the world’s best sleeper; able to sleep anytime, anywhere. As I’ve gotten older, however, it’s gotten less easy. So, I stared into the dark woods, listened to the night sounds and hoped to doze off again. When the robins started singing I gave up. I checked the time: 4:45. Still dark. I got to thinking as I sat there waiting for the sun to rise about why birds would sing before dawn in the summer. I can understand in the spring, as the male birds want to attract females, so why not get an early jump on the competition. But in the summer, why sing so early? Why sing at all, really? The breeding season, for the most part, is over, so impressing females shouldn’t be at the top of their list. That is the beauty of thinking, of course. You come up with theories, right or wrong, about your questions. Robins are the most-hearty singers in the morning in the summer, at least at my place. Robins are early nesters, getting started before a lot of our songbirds. They also have several broods each year — two or three in New England. So, it made sense to me that a robin would be singing that early because he may still be in the breeding season. In my weary ruminations, I thought of another reason. Birds sing for two main purposes: to attract females and to protect their territory. The breeding season might be over, but the task of raising young is still at hand. A bird waking up that early to sing is calling out to other birds that they are alive and well to stay the heck away. Now for the beauty of the Internet: You can discover what others think on the subject. There are other theories on why birds sing so early — atmospheric condition is one theory — but I will leave the scientific research to those more capable. I did find some interesting tidbits on singing. Bird pairs recognize each other’s “voice.” It is mostly the males that sing, of course, but all birds call to each other. The songs and calls may all sound the same to us, but birds can recognize individuals by the nature of the sounds. Some females do sing. I’ve heard female cardinals singing on plenty of occasions. I’ve read that female grosbeaks and orioles also sing. Sleeping outside (the screened-in porch is close enough to outside) opens your eyes and ears to the dark side of nature. I mean dark in a literal sense, of course. Also, when sleep escapes you, it gives you time to ponder.